Computer Hardware is the physical part of a computer, as distinguished from the computer software that executes or runs on the hardware. The hardware of a computer is infrequently changed, while software and data are modified frequently. The term soft refers to readily created, modified, or erased. These are unlike the physical components within the computer which are hard. When you think of the term computer hardware you probably think of the guts inside your personal computer at home or the one in your classroom. However, computer hardware does not specifically refer to personal computers. Instead, it is all types of computer systems. 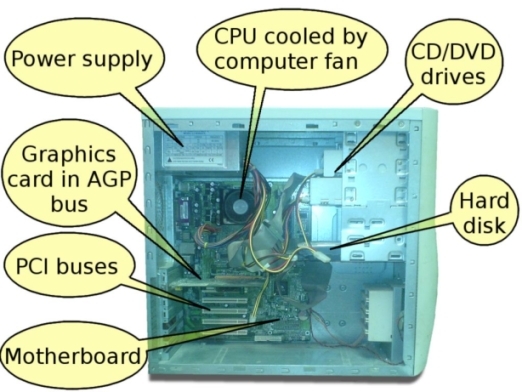 Computer hardware is in embedded systems in automobiles, microwave ovens, CD players, DVD players, and many more devices. In 2003, only 0.2% of all microprocessors sold were for personal computers. How many other things in your house or your classroom use computer hardware? 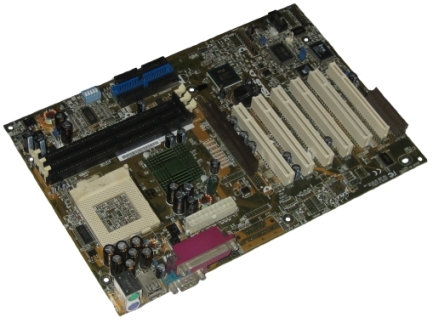 The motherboard is the body or mainframe of the computer, through which all other components interface. It is the central circuit board making up a complex electronic system. A motherboard provides the electrical connections by which the other components of the system communicate. The mother board includes many components such as: central processing unit (CPU), random access memory (RAM), firmware, and internal and external buses. The Central Processing Unit (CPU; sometimes just called processor) is a machine that can execute computer programs. It is sometimes referred to as the brain of the computer. There are four steps that nearly all CPUs use in their operation: fetch, decode, execute, and writeback. The first step, fetch, involves retrieving an instruction from program memory. 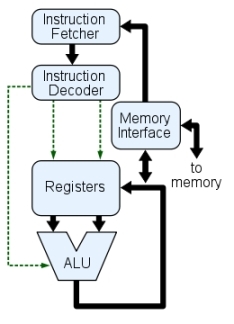 In the decode step, the instruction is broken up into parts that have significance to other portions of the CPU. During the execute step various portions of the CPU, such as the arithmetic logic unit (ALU) and the floating point unit (FPU) are connected so they can perform the desired operation. The final step, writeback, simply writes back the results of the execute step to some form of memory. 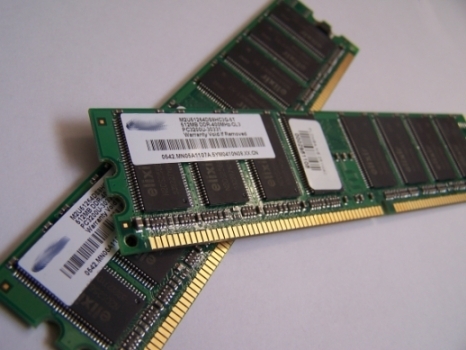 Random access memory (RAM) is fast-access memory that is cleared when the computer is power-down. RAM attaches directly to the motherboard, and is used to store programs that are currently running. RAM is a set of integrated circuits that allow the stored data to be accessed in any order (why it is called random). There are many different types of RAM. Distinctions between these different types include: writable vs. read-only, static vs. dynamic, volatile vs. non-volatile, etc. The power supply as its name might suggest is the device that supplies power to all the components in the computer. Its case holds a transformer, voltage control, and (usually) a cooling fan. The power supply converts about 100-120 volts of AC power to low-voltage DC power for the internal components to use. The most common computer power supplies are built to conform with the ATX form factor. This enables different power supplies to be interchangable with different components inside the computer. ATX power supplies also are designed to turn on and off using a signal from the motherboard, and provide support for modern functions such as standby mode. If your putting something in your computer and taking it out is most likely a form of removable media. There are many different removable media devices. The most popular are probably CD and DVD drives which almost every computer these days has at least one of. There are some new disc drives such as Blu-ray which can hold a much larger amount of information then normal CDs or DVDs. One type of removable media which is becoming less popular is floppy disk. CDs are the most common type of removable media. They are inexpensive but also have short life-span. There are a few different kinds of CDs. 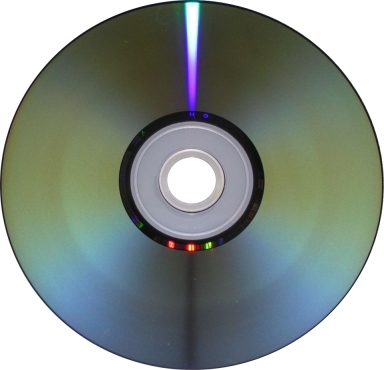 CD-ROM which stands for Compact Disc read-only memory are popularly used to distribute computer software although any type of data can be stored on them. CD-R is another variation which can only be written to once but can be read many times. CD-RW (rewritable) can be written to more than once as well as read more than once. Some other types of CDs which are not as popular include Super Audio CD (SACD), Video Compact Discs (VCD), Super Video Compact Discs (SVCD), PhotoCD, PictureCD, CD-i, and Enhanced CD. There are two types of devices in a computer that use CDs: CD-ROM drive and a CD writer. 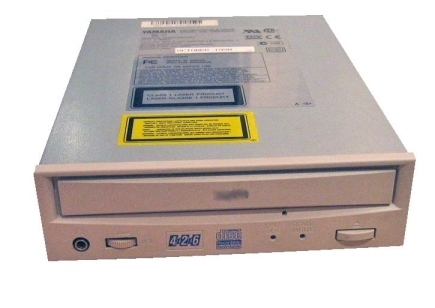 The CD-ROM drive used for reading a CD. The CD writer drive can read and write a CD. CD writers are much more popular are new computers than a CD-ROM drive. Both kinds of CD drives are called optical disc drives because the use a laser light or electromagnetic waves to read or write data to or from a CD. DVDs (digital versatile discs) are another popular optical disc storage media format. The main uses for DVDs are video and data storage. Most DVDs are of the same dimensions as compact discs. Just like CDs there are many different variations. DVD-ROM has data which can only be read and not written. DVD-R and DVD+R can be written once and then function as a DVD-ROM. DVD-RAM, DVD-RW, or DVD+RW hold data that can be erased and re-written multiple times. DVD-Video and DVD-Audio discs respectively refer to properly formatted and structured video and audio content. The devices that use DVDs are very similar to the devices that use CDs. There is a DVD-ROM drive as well as a DVD writer that work the same way as a CD-ROM drive and CD writer. There is also a DVD-RAM drive that reads and writes to the DVD-RAM variation of DVD. Blu-ray is a newer optical disc storage media format. Its main uses are high-definition video and data storage. The disc has the same dimensions as a CD or DVD. The term “Blu-ray” comes from the blue laser used to read and write to the disc. The Blu-ray discs can store much more data then CDs or DVDs. A dual layer Blu-ray disc can store up to 50GB, almost six times thecapacity of a dual layer DVD (WOW!). Blu-ray discs have similar devices used to read them and write to them as CDs have. A BD-ROM drive can only read a Blu-ray disc and a BD writer can read and write a Blu-ray disc. 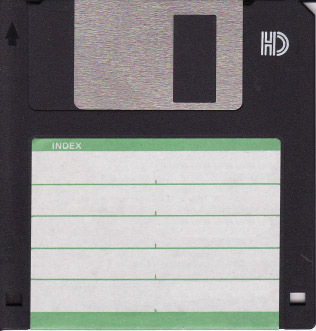 A floppy disk is a type of data storage that is composed of a disk of thin, flexible(“floppy”) magnetic storage medium encased in a square or rectangular plastic shell. Floppy disks are read and written by a floppy disk drive. Floppy disks are a dying and being replaced by the optical and flash drives. Many new computers do not come with floppy drives anymore but there are a lot of older ones with floppy drives lying around. While floppy disks are very cheap the amount of storage on them compared to the amount of storage for the price of flash drives makes floppy disks unreasonable to use. Internal storage is hardware that keeps data inside the computer for later use and remains persistent even when the computer has no power. There are a few different types of internal storage. Hard disks are the most popular type of internal storage. Solid-state drives have grown in popularity slowly. A disk array controller is popular when you need more storage then a single har disk can hold. A hard disk drive (HDD) is a non-volatile storage device which stores digitally encoded data on rapidly rotating platters with magnetic surfaces. Just about every new computer comes with a hard disk these days unless it comes with a new solid-state drive. Typical desktop hard disk drives store between 120 and 400GB, rotate at 7,200 rpm, and have a madia transfer rate of 1 Gbit/s or higher. 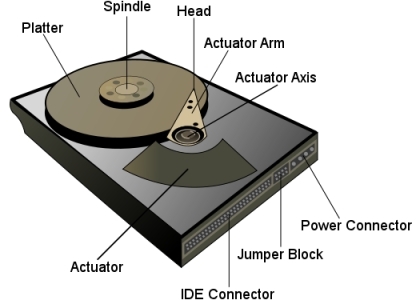 Hard disk drives are accessed over one of a number of bus types, including parallel ATA(also called IDE), Serial ATA (SATA), SCSI, Serial Attached SCSI, and Fibre Channel. A solid-state drive (SSD) is a data storage device that uses solid-state memory to store persistent data. An SSD emulates a hard disk drive, thus easily replacing it in any application. SSDs have begun to appear in laptops because they can be smaller than HDDs. SSDs are currently more expensive per unit of capacity than HDDs which is why they have not caught on so quickly. A disk array controller is a device which manage the physical disk drives and presents them to the computer as logical units. It almost always implements hardware RAID. RAID (Redundant Array of Independent Drives) is a technology that employs the simultaneous use of two or more hard disk drives to achieve greater levels of performance, reliability, and/or larger data volume sizes. A disk array controller also provides additional disk cache.